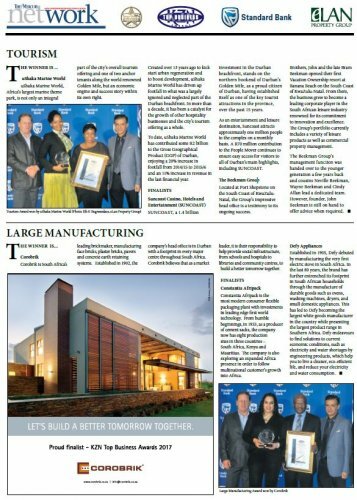 Corobrik is South Africa's leading brickmaker, manufacturing face bricks, plaster bricks, pavers and concrete earth retaining systems. Established in 1902, the company's head office is in Durban with a footprint in every major centre throughout South Africa. Corobrik believes that as a market leader, it is their responsibility to help provide social infrastructure, from schools and hospitals to libraries and community centres, to build a better tomorrow together. Constantia Afripack is the most modern consumer flexible packaging plant with investments in leading edge first world technology. From humble beginnings, in 1933, as a producer of cement sacks, the company now has eight production sites in three countries - South Africa, Kenya and Mauritius. The company is also exploring an expanded Africa presence in order to follow multinational customer's growth into Africa. Established in 1905, Defy debuted by manufacturing the very first electric stove in South Africa. In the last 80 years, the brand has further entrenched its footprint in South African households through the manufacture of durable goods such as ovens, washing machines, dryers, and small domestic appliances. This has led to Defy becoming the largest white goods manufacturer in the country while presenting the largest product range in Southern Africa. Defy endeavours to find solutions to current economic conditions, such as electricity and water shortages by engineering products, which help you to live a cleaner, eco-efficient life, and reduce your electricity and water consumption.